Inspired Women Business Alliance - 501(c)(3) Nonprofit Charity for the empowerment of women in small business. Inspired Women Business Alliance is a 501(c)(3) nonprofit for empowerment of small business to strengthen family and community. Inspired Women Business Alliance gratefully accepts your generous donations. Every donation is tax deductible. Every donation fuels our mission to provide the very best space for women to thrive, create, and gather. Ask how you can help today. Are You A Woman Interested In Small Business? "There is no force equal than a woman determined to rise." IWBA has a mission; empower small business to strengthen family and community. Inspired Women Business Alliance is one of the largest supported networking groups available in San Gorgonio Pass and surrounding cities. 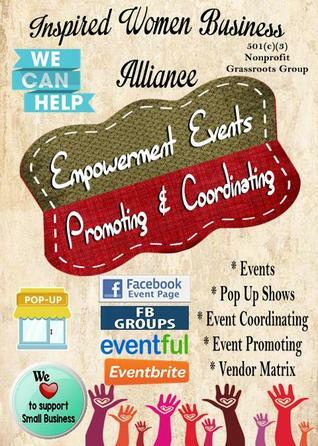 Our organization’s greatest benefit is to showcase entrepreneurs through monthly community events, meet-ups and classes. Whether you are a small business, a home business, an artisan, maker, designer, or rep for a company; we are here to encourage you. IWBA's supporters are real women with big dreams; support from like-minded women we all have equal opportunities to rise and become successful. More women every year are finding ways to increase extra cash by operating a small business. Supplementing an existing income from home is more main stream now thanks to social media. Small businesses recycle more of their profits back into their communities. We've created a venue for all this forward thinking to exist. Support our vision ~ Join us on Facebook! Connect with other women, find supporters, and create important partnerships to help your business reach its potential. Do you have a Pinterest Acct.? We can create your business its very own board to pin to! No charge, just another way to support and empower your business. New items.. grain free dog treats, grain free dog food. Newspaper, puppy shampoo, Canned dog food. Learn how to become a foster, adopt, and hear success stories.